Get prepared so you know how to react if colic strikes! You should know the obvious signs of a colicking horse. 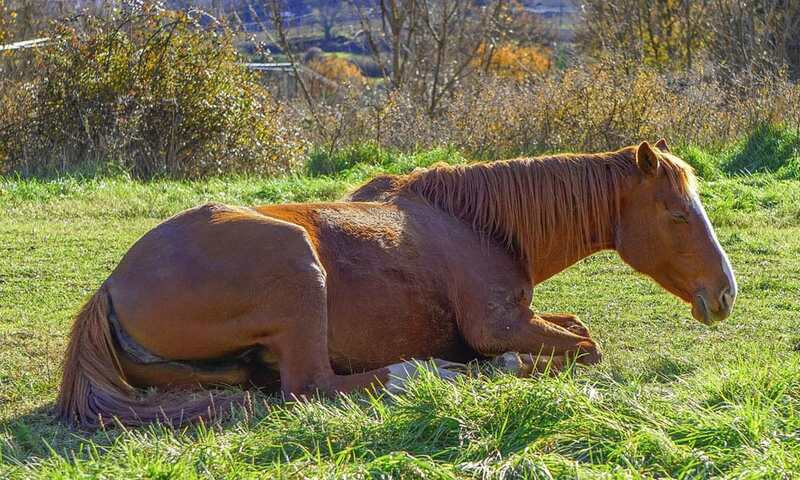 Any horse can be at risk for colic. It doesn’t discriminate against breed, gender, or age. This condition causes abdominal pain usually from gas, too much grain, impaction, sand consumption, parasites, etc. It’s essential you know what to look for and how to react! 1. DO look for feces. If you don’t see any or very little in your horse’s stall, you could have a problem. 2. DON’T wait around to see what will happen without consulting your veterinarian. The situation can get considerably worse as time passes. 3. DON’T allow your horse access to hay, grass, or grain. Food can make this condition even more problematic. 4. DO walk your horse to encourage gut movement. Aim for 45-60 minutes at a brisk walk. 5. DO monitor your horse closely. They need your undivided attention or, at the very least, every 15-20 minutes check in on them. 6. DON’T allow your horse access to water until you’ve spoken with a vet. 7. DO call a vet out immediately. 8. DO take your horse’s temperature and check their heart rate. You can also feel for heat in the hooves and muscle tightness in the hindquarters. 9. DON’T medicate your horse without clear directions from your vet. 10. DO keep your horse in an area where they’ll be safe. This could be a large stall or pen. One final tip: never underestimate colic! It can be very deadly when left unmanaged.